KUALA LUMPUR: THE National Defence University of Malaysia (UPNM) emerged as Malaysia Commercialisation Year (MCY) Supreme Award (Overall Winner) with an invention that assists in the command, control, communication and coordination of troops for the military. 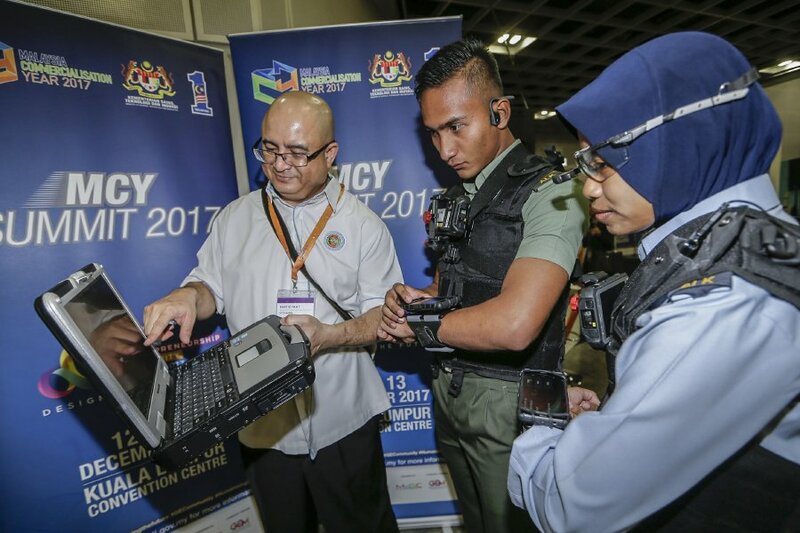 UPNM lecturer Associate Professor Captain (Rtd) Syed Nasir Alsagoff Syed Zakaria said the invention, Tactical Communications Operation Management System (TACCOMS) was very beneficial for the troops during a mission. “In a mission, a commander can monitor the troops from a map on a server using Global Positioning System,” he said during an interview session yesterday at Kuala Lumpur Convention Centre. Syed Nasir said his 16 years of service in the Royal Malay Regiment in the parachute unit helped him to identify the use of technology to help the military. He said TACCOMS was developed from scratch over a period of six years using a grant by the Higher Education Ministry and the Techno Fund from the Science, Technology and Innovation Ministry. The funds were used to develop the technology at the university’s Defence Science and Technology Faculty. “The students also helped me to test the system,” he said. On the invention, he said a commander can monitor a troop from a map on a server. “The server will display the map and the locations of each individual wearing the body harness, hand wearable, a pair of smart glass and bone conduction headset,” he said. Syed Nasir said with the usage of the system, the commander can detect the movement of every individual, and give orders from the server. “The commander can even send a picture of an enemy if he spots one from the map to alert the troops,” he said. Besides that, the troops can send voice messages to the commander and at the same time, the commander can pick up noise from the surroundings, thus it can replace the use of radio. “The individuals can also detect the location of their comrades by viewing their locations on a map using the hand wearable,” he said. Syed Nasir said there was no such product in the market yet. “We have conducted testing for individuals deployed in Bangladesh, China and Malaysia at the same time and the location of all of them were detectable. It means military operations can be centred anywhere in the world,” he said. He said the system has the potential to be used by police, firemen, as well as the immigration and customs departments. Syed Nasir said UPNM, as a technology provider has partnered with ARS Sejahtera Sdn Bhd which will deal with the sales aspects. The company is involved in military communications gear business. ARS managing director Datuk Abdul Rahim Saad said the technology is of great benefit to the nation. “UPNM provides the software and we will provide the hardware.” he said. Abdul Rahim said the company aims to showcase the technology at international defence exhibitions in United Arab Emirates, Turkey and United Kingdom among others. For the same invention, UPNM also won the Researcher Entrepreneur Award. The Commercial Deal Award went to an invention called Ananocoat which is being commercialised by Anano Sphere Sdn Bhd. Its managing director Sreelaththa Sreekantan, said the product is a coating technology to coat the interior of the walls. “When it reacts with the light, it can help to eliminate bacteria and odour from volatile organic compounds,” she said. Sreelaththa said the technology which was from Universiti Sains Malaysia was first commercialised in 2014.
technology from the university,” she said. Sreelaththa said they were looking into market penetration in the Asean region and are aiming to enter the United States market as well. The Research and Business Partnership Award was won by the Malaysian Palm Oil Board (MPOB) with an invention of Palm-Based Chicken Feed. MPOB researcher Rohaya Mohamed Halim said for this invention, premium palm kernel cakes are used as the main ingredient together with corn, fish food and additive. For the Emerging Innovator Award, it was awarded to LiGNO Biotech Sdn Bhd for the growth of medicinal mushroom Cordyceps sinensis. Its chief executive officer Ng Szu Ting said LiGNO Biotech is a mushroom cultivation biotechnology company that focuses on medicinal mushrooms. “We are a BioNexus status company under Bioeconomy Corporation,”she said. “We are growing the fruiting bodies of Cordyceps sinensis after our success in cultivating tiger milk mushroom,” she said. “It is a breakthrough for us to be able to cultivate the fruiting bodies of this mushroom because usually the one sold in the market is Cordyceps militaris species. Ng said they spent five years since 2012 in research and development. “We have a factory and grow the mushroom in a room using tissue culture,” she said. Meanwhile, the Social Entrepreneur Award went to Terapi.my which is a booking platform for Malay traditional massage. Its representative Wan Hairul Azzuan Wan Hanudin said the company provides the platform to book massage service to homes and to offices. “It started when I wanted to find a confinement lady for my wife. I realised that even my neighbours had the hidden talent and are good therapists but they do not have the platform to showcase their talents,” he said. Wan Hairul said all therapists that are registered with them are certified by Institute of Physical Science Culture and Arts. “We will get a commission in return from full payment. It took six months to develop the system and we let the Health Ministry review our service,” he said. Prime Minister Datuk Seri Najib Razak gave out the awards during his walkabout session at MCY 2017 in conjunction with GECommunity Summit 2017. 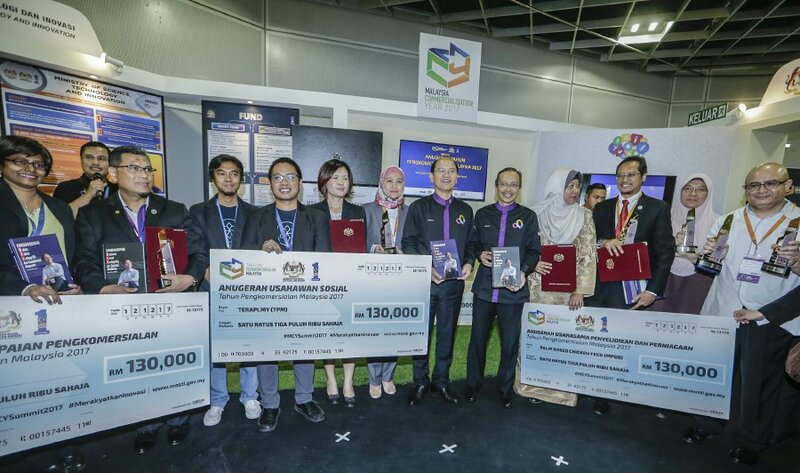 The cash prizes for all main winners of the awards were worth up to RM750,000. The winners also received trophies and certificates. Also present was Science, Technology and Innovation Minister Datuk Seri Panglima Wilfred Madius Tangau. Wilfred said he aimed to make the award as an annual event to encourage innovators to keep on producing technologies or products to be commercialised so it will drive the nation’s economy. “This year, there are 130 technologies or products with potential to be commercialised out of 270 participations,” he said. His book, titled Communicating Science, Trust, Integrity for Societal Wellbeing was launched by Najib at the event.